I'm not seeing these percentages. Mainly the percentage of people that speak french is much higher. Very interesting chart, using a completely different analysis technique. Evidently the "official" Linden technique might be to map country-of-origin to language. But your method is probably better, since the SL residents declare their languages in their profile. Peter, are you reading this? Which percentages do you see in your business? I took the official metrics posted by LL, and then did a breakup on countries. For example Belgium is like 45% Dutch, 45% French and 10% German, Switzerland is like 60% German and 40% French. I also accounted for a certain amount of Spanish speaking population in the US, and French speaking population in Canada. 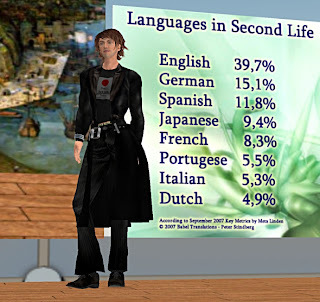 Admittedly my statistics is some guesswork, but from my travels inside SL it seems pretty accurate. I don't think user's profiles are a reliable source. In my close circle of friends, for example, there are 3 Germans not listing German at all in their profiles, but only English. Judging from Avatar profiles alone will give English an "unfair" advantage. - the method used by Peter gives information about the *first* language of residents. - we don't know if the profiles that have no languages information distort the overall statistics.